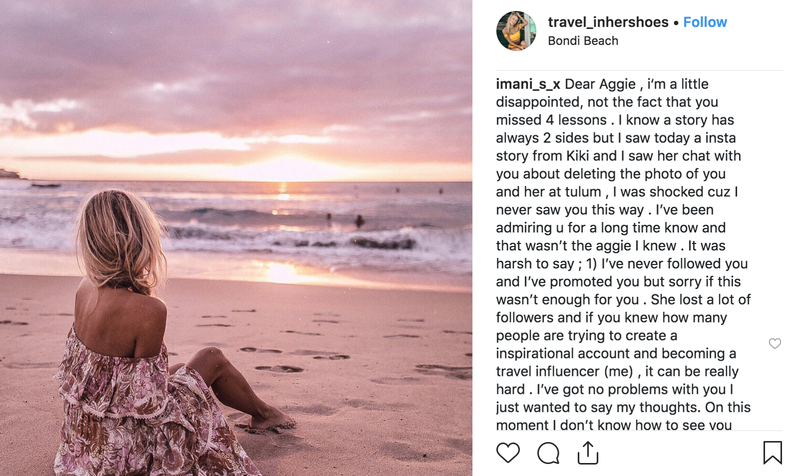 Is Aggie Lal aka travel_inhershoes a bad teacher? Hello! 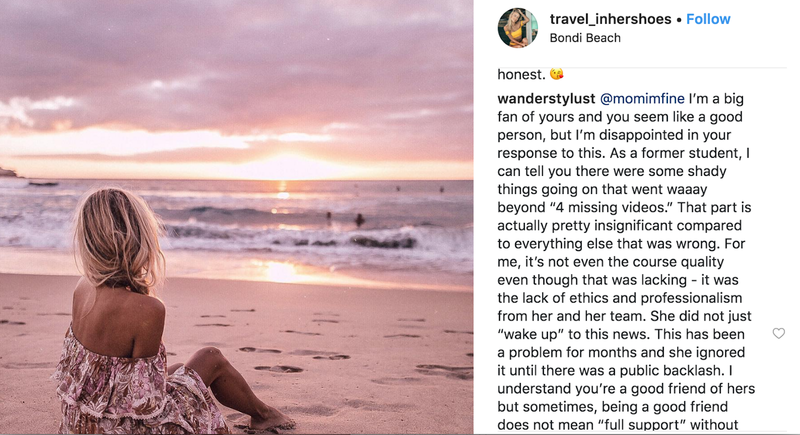 I am most likely just like you: I want to build a strong Instagram profile and inspire others to travel and get the best out of Instagram. 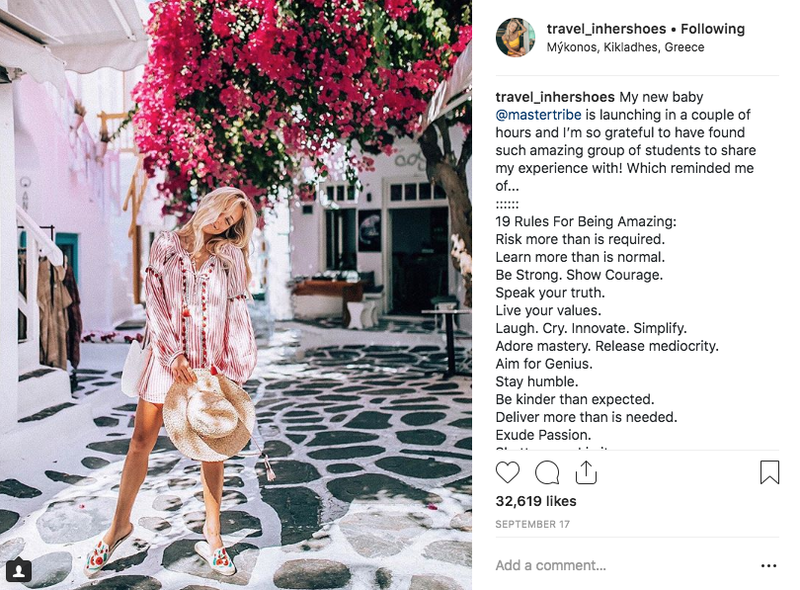 I am still small and feel like I have a tone to learn so I invested time and money (a lot of money- $497, exactly) with the promise to be the course of the year: How To Grow Your Instagram: Everything you need to know to grow your Instagram (& travel the world!) by the powerful Aggie Lal, aka @travel_inhershoes. 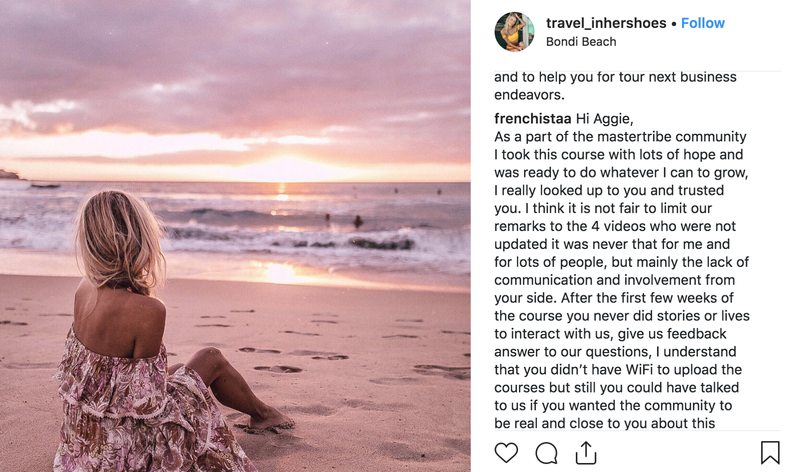 The course was promoted quite hard by herself and her previous students, other influencers. Nothing out there to rise a red flag about it. Wait! Actually there was, but I was too excited to see it then. She mentioned in her stories that she didn’t really want to do this course but all her mentors told her she can’t become great and leave a legacy without teaching and sharing with others what she’s good at. Before signing in I asked some of the reviewers of her class how was it. I received good feedback. I also check the Class Curriculum that looked quite good, nice intro, touched the subjects I am interested about, all good. So, no good reason to hold back on it. There I was, first line. I got accepted in the MasterTibe Instagram page and each day they posted a picture for the topic and we (almost 500 people) got engaged under that post. It was awesome, we were becoming a community, a team! We created a facebook group and a slack one to keep in touch and talk to each other. That was super nice till the end of the week when she posted a challenge and everything was ruined. Why? Because the challenge was to sell her presets as an affiliate (that most of us didn’t use and had no idea if are ok or not) and to get another affiliate link to sell the class we just started. Wait, what? Rewind. Sell something you don’t have a clue that is ok or not. If we are doing that I have a pink book with a cool title that I want to sell. Hey, guys, would you be some kind to sell if for me? I swear it’s good. I wrote it. Does this still works in 2018? This was the week you could decide if you want a refund or not. This, first week, 7 days. Or, so it was told by the MasterTribe in the description. after a big #bombtruth she changed it to the one impose by the Teachable, the platform she used for the class. Aggie also shared some stories about some students that asked for a refund then and called them “bad apples”. But, no, that wasn’t enough for me to quit. I am not a quitter. I decided that the huge second red flag wasn’t enough for me so I keep going. I know, I know… I am not very smart. Even tho’ the curriculum sounded good, the info provided was very low quality. I was sad that I decided to go on, but it was too late, the first week was gone. Things got worse. Between advices like don’t use a #puppy hashtag if you are not posting puppies to questions that I didn’t receive and answer something else popped up: it turns out the one week refund claim was against Teachable’s refund policy. They required a 30-day refund. Wait, what, again? That was my cue to get the hell out of here. And that’s what I did. I was lucky enough to get out while Teachable still had the money. Someone finally found a way out for the most of us. Unfortunately I have friends that pay the class through Paypal friends and family. Yup she did that too. Taking money any way it’s possible- smart girl. They couldn’t asked for a refund. 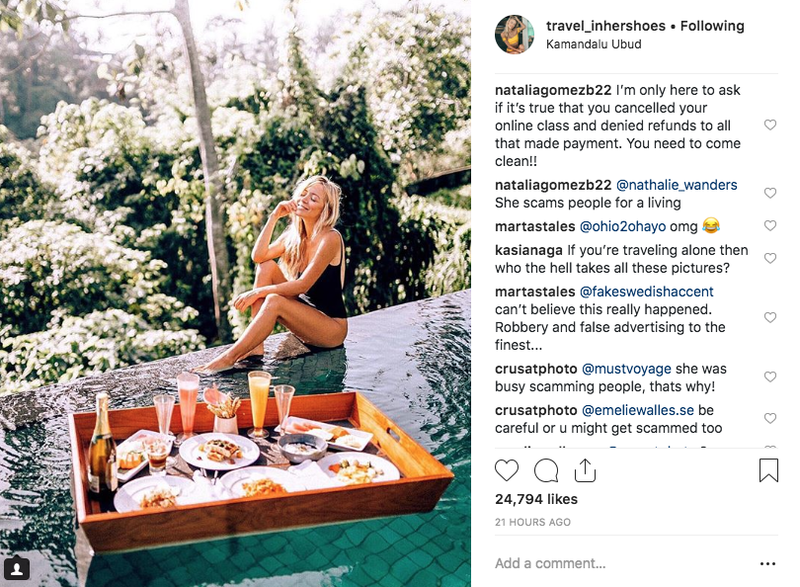 And a lot of people who asked for a refund could not get it because she decided to switch to custom payment gateways, that translates into the fact that their transactions are handled by a third party processor, not Teachable. Yup, apparently you can do that. Unfortunately Teachable has nothing to refund anymore at this time. She outsmart all of us again. Was I happy with the result of the six weeks I took Master Tribe? Hell no! It’s a scam. It was from the first week and it still is. It’s literally like taking candy from babies. I can understand not all of us are teachers. And that is ok. If you blew it up like this at least be honest, admit your damn mistake, apologise and give the candy back. Refund all those people that believed in you and pray that they are kind enough to forgive. You are a business woman, take some responsibility on what you do! This class promised direct communication with you, Aggie Lal, not you secretary or manager. Also these videos should have been done before the class started, not during it or after the class was done. If you offer a service that is bad and don’t meet the promises you made, deal with the reality, the client has the right to get the money back. Easy as that. Excuses. She was sick. She didn’t have a WiFi to upload more content and she had to use the one she did have to upload her very first vlogmas on YouTube. I am not so upset about the low content but I cannot handle the indifference she treated all of this and all the lies! Refund lies, content lies, disappearing for months, leaving questions unanswered. Here’s my two cents on this, shorter version: if you don’t have anything to do with your money, please, take the Master Tribe class. I really recommended it for all the mess and frustrations it brought to the surface. If you want to be frustrated in a short period of time, this is goals! You can see that from all the screenshot my other colleague took from the Facebook and Slack groups. After two articles were published she finally wrote an “apology” for all the Master Tribe students. If she doesn’t have a twin sister that did all her stories and she was in a comma for the last 3 months I don’t understand HOW could she just woke up to this. Students were disappointed for a while. Everyone was messaging her and her assistant. But we didn’t receive any answers! The most sad part is this - 4 out of 66 videos - this is what she understood that 400 people were bothered by and this is what she is passing on. But the problem is different as many students point out.